Karuvadu fry or dry fish fry is one of the most favorite recipe of all fish lovers. It tastes spicy, delicious and tangy with irresistable aroma. It can be made quickly as well as easily at home. The whole frying process takes almost just 10 mins and makes a tempting meal in any non-vegetarian family. We know dry fish are good source of calcium and we get it in all Indian grocery stores. 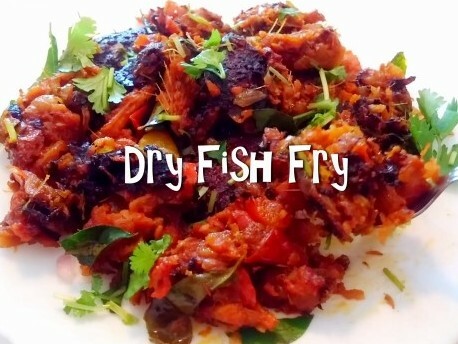 Check out this simple video recipe to make authentic delicious karuvadu fry. Clean and wash dry fish thoroughly. Drain water and set aside. Add mustard, cumin, split urad dal and allow to splutter. Add grated garlic and curry leaves. Add sliced onions and coriander leaves. Saute until onions turn transculent. Add ginger garlic paste and salt. Add sliced tomato and cook until oil separates. Add turmeric pwd, red chilli pwd, coriander pwd and cumin pwd. Add 1/4 cup of water and allow to cook. Coat the masala well on fish. Cover and cook in low flame for 5 mins. Open the lid and drizzle a tsp of oil. Roast it in low flame until the curry reaches desired consistency. Garnish with finely sliced curry and coriander leaves. Spicy Karuvadu fry is ready. Enjoy hot with sambar rice, rasam rice or any dish of your choice.